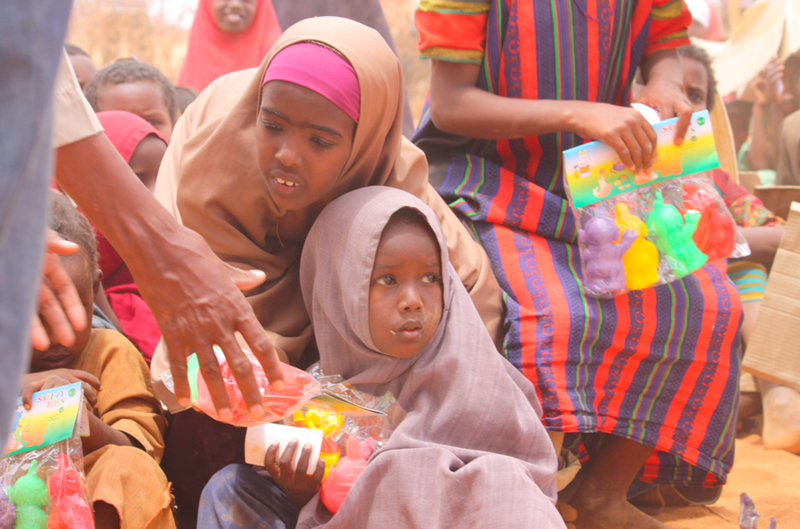 I’ve recently returned from a trip to Dadaab, the world’s largest refugee camp. I was asked to join the Al Jazeera Director General on this trip in order to help create greater awareness about the situation through “new media” tools. Having read about the stories coming out of Somalia and looking through a ton of photo galleries and videos I thought that I had somewhat prepared myself for the trip. For the first time in my life, I now know what it means when people say “words cannot describe what I’ve seen.” It was tough. Very tough. The people who make it to Dadaab are the “lucky” ones – others have perished on the side of the road, on their way to Dadaab. The stories that were told were… devastating. Parents having to decide which child to leave behind so that they could make sure the fittest would be able to make it to camp. Imagine having to leave your weakest child behind, on the side of the road, to die. That’s it. Left for the vultures. The lucky ones will die before and at least get a burial. Another told a story of how his baby had to breast feed of his dead wife so that they could have enough strength to go on with the journey. I felt ashamed to call myself a human being. There are countless more stories like this, they’ve been told over and over and over. The thing that has hit me most about this, is that it’s not new. Dadaab has been around for over 20 years. Famine and drought are known to occur in these places, yet year after year people are dying of starvation. Why? We met people standing in queues to just get one meal for the day. People who are fighting for the right to live. For human dignity. For just a chance. That’s all they want. A chance at life. Looking into the eyes of children you always get a sense of joy, a sense of optimism that can defeat anything. When I looked into the eyes of some of the children in the camps they looked defeated, worn out, life had taken its toll on them. I’m talking about children who are not older than 3 years old. They’re still the lucky ones. Seeing babies who are malnourished, children without the strength to even stand. The skeletal structure of a living human. This is Dadaab. This is our problem. Yet, the story goes mostly unnoticed. Once in a while people will talk about it in the media, there will be hype for a bit, and then the search for a new story moves on. And we forget that the old story has not ended. In fact it’s grown to proportions beyond anyone’s imagination. With the world of Social Media, everyone likes to talk about how technology can overthrow governments and change the world. How it can mobilise people around a cause almost instantaneously. How we always know what is happening, at any time, anywhere in the world. When people have not eaten for weeks, have just enough cloth to cover a bit of their body, the last thing that is going to happen is for them to start a revolution with a # tag to get the world’s attention by telling their own story. They need us to do it for them. They need us to be the ones to show the world what’s happening. I don’t actually think that I’ve ever seen Somalia trending on twitter. Ever. Will the world only pay attention when it makes it to the top of the trending topic list? When it gets it’s own special # tag? When it becomes “cool” to join a cause? Maybe if lady gaga was to visit Somalia it’ll trend? She could maybe take her meat dress with her and put it to good use? What is happening in the world is real. The stories out of Somalia are not some movie. Visting Dadaab felt like I was going to a different planet. I still can not believe that a couple of hours away from me, someone is about to die because they do not have enough to eat. It’s just so real. A realness that’s disturbing, that’s uncomfortable. One that is easy to pass on as not our problem, because if we acknowledge it, the sheer weight that falls on our shoulders to make a difference becomes frighteningly unbearable. I type this while I’m sitting at home, with my fridge stocked, countless food places to get food from and with the luxury of eating to enjoy the taste of the food. Where did it all go wrong? How can we, as humanity, sit back and let this continue? We have all seen the videos. We have seen the pictures. We’ve heard the stories. What are we going to do about it? At the very least let’s tell the world what’s going on. Be the # tag the people in Somalia need us to be, for the sake of our humanity. If we cannot even get #somalia to trend, then I’m scared for what the future holds for us as a human race. If only we paid as much attention to the African Summers as we did to the Arab Spring. The first tweet that show’s up on the page is really the point behind this post. There is a lot to say about the role Social Media played in this, I do think that a lot of people seem to be missing the point on what exactly Social Media can and does do in shaping events. Think back to the Iran Elections and how the lack of context really sent many main stream media organisations down the wrong path on how to cover an event using stories from social networks. If my memory serves me correctly, at one point during the IranElections we had over 250,000 tweets using the tag #iranelections – I wonder how many tweets came out about #sidibouzid? In Tunisia, it was not about mobilising people through Social Media, it was about broadcasting what was going on to those who chose to listen. Without the tweets, facebook posts or YouTube videos we would not have known about the initial protests… or would we? Only once mainstream media picks up on a story and decides what importance it should have, do people really notice what is going on (Iran Elecations case in point). Tunisia has been developing for the past 29 days – but only now do people seem to really notice it, once they’ve seen the news on their local television station. People still turn to mainstream media to get their information. The challenge is in what mainstream media would consider to be important news… The techcrunch article has a couple of other good tweets discussing what other media organisations in the US were talking about during the events earlier in Tunisia. Evgeny Morozov has a great post on the this topic and it is well worth a read. If you only found out about the events in Tunisa in the past 24hours, perhaps its time for you reconsider who you get your news from? A good start would be to check out the amazing coverage our web team has been working on since the events started almost a month ago over here. And if you dont want to miss the next big story because your twitter trends didn’t tell you about it, you may want to set Al Jazeera as your homepage, or follow us on twitter or follow us on facebook. The session I presented on Iran can be watched here. You can also find my comments regarding the importance of context in #iranelection here. Congrats to the media140 team for putting on a great show. This post is pretty longas it has about 8 months worth info in it. The past 8 months have been pretty interesting (or annoying), I’ve been bouncing up and down with one of the local mobile operators in South Africa regarding an error on my data roaming bill. I’m not sure if I should mention the companies name yet or not, as the case is still currently open (I am tempted to though). I know quite a lot of people have received huge shocks on their bill when data roaming, it is no doubt expensive. As it turns out though, telco’s can and do sometimes make mistakes with their billing. The problem is, without any sort of technical knowledge, you’re most likely going to land up paying the bill, as the telco will not really look into the validity of each and every line item. Fortunately, I have an awesome network of colleagues, who are in the field. All of whom have been able to look at the details of the bill and see that there are some technical irregularities that need further clarification. What is really interesting in all of this, is the repeated attempts from the telco and the service provider whom we have a contract with, to bully us into paying the account. For 8 months, we have repeatedly sent information proving the technical impossibilities of the case. Yet, they seem to come back with the same generic responses without actually responding to our main concerns…. One such example is the possible manipulation of dates in emails chains to make the responses seem more relevant… which was quite shocking. In July our service provider called up and insisted that the telco had verified the charges are correct and as such payment needs to be made, as the case has been pending for 8 months. When we asked our service provider to send us the official response from the network in July, she forwarded us an email with the telco’s reponse. The forwarded email was the same response we received back in March, to which we had responded with a list of questions for clarification (no response was received). 2) The middle part of the mail was the response from the network, which did not have any date, but was a copy and paste from an email that was sent through to us previously on March 5th. It is quite alarming that service providers can resort to such tactics in order to force payment from unsuspecting clients. I do wonder how many people have been forced into making payments that were incorrect. Here are the details of the actual dispute…. In December ’08 – I was roaming with a South African sim card in the UAE. On December 23rd we received an itimised bill for an amount around R4,000 – this was alright as the data roaming charges are ridiculously priced… around R175 per MB. On January 16th, we were sent an updated bill…. with one additional line item, for the value of around R61,000 (crazy, I know). Which stated that the one line item had +-430 megabytes of data downloaded during that session (on a mobile phone). I had no idea we needed to present our credentials through to a telco in order to dispute a case. Thats some great customer services for you. After checking the calculations with various experts, they all do agree, that the calculations are valid. I know that no download happened, as I was asleep at the time. The call data logs on my device (which I had for a 6 months before the event) show a total data usage of only 138MB. The itimised bill does not have any time stamp on the actual duration of the session, if I was to look at the next line item in the bill, the time duration between the two incidents is around 6 hours. I also serioulsy doubt that the battery of the device would have lasted for 6 hours with an active GPRS connection. So, if I was to assume that I was able to receive the maximum possible bandwidth (48kbps) it would have taken me around 21 hours to download 441 megabytes. Perhaps this example can explain better; you open your email and you establish a connection with your email ISP or server. Your inbox starts to update and every bit of information has a data size and gets downloaded to your device in packets of varying size as and when a timeslot is available. So, whilst your email is updating, you decide to check out the news and you open your browser. As soon as this happens, whatever you see is updated which again is data sent. The key point that they have missed, is that the total maximum bandwidth thats available is 48kbps. So, the data rates will be split in order to suit the amount of web applications that are running. So I could be downloading a file, opening email and browsing 5 different websites, the bottom line is that everything will take very long to load as I only have 48kbps available. I also looked at the average data speed for the 3 data sessions that happened prior to the event happening. Based on the average speed, it would have taken me around 350 hours to download 430 megabytes of data. The main arguement from the South African network is that the CDRs are correct. When we requested them to provide us with more detail, to look at the actual time duration of the event (EDR, VLR etc.) they were unable to do so, as the foreign network has not supplied them with the information to date. They also do not have any record of the IMEI number for the device that was supposedly used. When asked regarding the technical possibility of downloading the content, the response is that in theory on 3G/HSDPA it is possible to download that much data, in the specified time frame, as the minimum guarantee of speeds is GPRS. The telco conveniently ignores the confirmed email correspondence from the foreign network that clearly states it is a GPRS connection. The final statement from the network is that our claim is against the foreign network, we should get the info ourselves. Either way, the lesson learnt: Do not roam with data and if you do need to roam and you receive a big bill, be sure to go through all the line items to make sure you’re not been charged for an event that did not happen. I must warn you though, dont expect to receive any sort of concern or love from your network (especially certain ones in South Africa). We even had a face to face meeting with the telco, I was out of the country so could not attend. The telco threw out technical terms, trying to catch my dad off guard. When my dad offered to call me to discuss technical issues, they refused to speak to me over the phone because as they put “he is the one who caused all of these problems.” The meeting eventually ended with the telco saying there is nothing more to discuss, and getting up and walking out. The case has been put forward to ICASA, the governing body in South Africa. We’ve also consulted our lawyers, all of whom were equally as shocked at the way in which the service provider and telco have responded to our concerns. I’ll keep you posted on the final outcome of this. This post is pretty late, but here is one of the interviews I had on Al Jazeera English discussing the role of social media in Iran. One of the key points I bring up in my interview is the importance of placing the information in context. Towards the end of the mass protests, the number of twitter accounts that we were monitoring dropped from 60 to around 6 (accounts we able to verify). Whilst the information coming out was amazing to show the government clamp down on protests, it is an incredible stretch to say that the information was a reflection of sentiment for the entire population of Iran (over 65million people). There are two important events that we need to look at. 1) The actual outcome of the election. Did Ahmadinejad win? Do the majority of Iranians feel the election results were incorrect? Its important to note that the protestors are not anti regime, they want reform, but reform within the current system. 2) The protests and the government clamp down on protestors. This is a focus on Mausavi supporters, who felt the results were incorrect. This what is generating the bulk of the discussions online. Whilst these two events are related, the information that was coming out online is specific to the second event. Once the government started clamping down on the protestors, social media played a critical role in getting the information out. It is important to understand who are the ones that are sending out the information, what are their backgrounds, where do they come from etc. Harvard provides an excellent analysis on the Persian Blogosphere – the reformists do have a much larger share of the online voice than the conservative voices. There is also a very big percentage of Iranians living outside of Iran who are online, blogging about situation. Ahmadinejad supporters are from the poorer, less connected section of Iran. As such a big percentage of them do not have any access to the internet at all. Their voices are not heard over social media, as such we are only getting one side of the story. Where social media wins, is the ability to report on the what and when. As events unfold, the immediacy of new technologies allows people on the ground the opportunity to get their voices out. In the case of Iran, it was used very effectively to show the government clamp down on protestors. Where social media fails, is its inability to provide context and answer the why behind each event. It also does not provide a true representation of the entire population, as the majority of the voices online reflect a minority of the population. The majority of the online population in Iran come from a wealthy, educated background and from the big cities such as Tehran (Mausavi supporters). This is contrasted with the poorer, not connected Ahmadinejad supporters, who are based in the smaller towns and rural areas. When we are dealing with developing countries, we often forget that the majority of the population have no access to simple communication tools, let alone social sites. A colleague of mine, Mohamed Nanabhay, brought up an interesting point regarding the South African elections earlier in the year. If you were to look at the twittersphere or blogosphere prior to and on the actual election day, you would think no one had voted for the ANC. However the ANC holds popular support amongst the majority of South Africans, the majority of whom are not online. This is the reality of the world we live in. Not everyone is connected. There is a need for us to dig deeper if we truly want to understand the nature of events. If you want to read up in more detail on the actual role of twitter in Iran, Gaurav Mishra provides a great analysis on the role of twitter. His post also has an extensive list of links to other blogs who have discussed the same issue. Propaganda has always played an important role in the way war is waged. Using the available traditional media platforms – such as television, radio and print – governments have battled for mindshare in an attempt to convince the public that military engagements are serving their best interests. Over time, new communication technologies have forced governments to realign their propaganda campaigns. In the modern age of warfare, government spokespersons have provided major news networks the opportunity to engage, question and dissect domestic, foreign and military policies. However, the recent war in Gaza has pushed the boundaries of traditional media as the debate on the conflict opened a new front – online. Though television has continued to provide viewers with in-depth coverage of the conflict, it did not sufficiently allow the average, frustrated person on the street to express their views. Enter the “social” internet – currently termed “War 2.0” or “War of Words” – where people from around the world used social networking websites such as Facebook, Twitter and YouTube to express their opinions to a global audience. With the internet becoming a battleground of ideas, the average person, armed with a keyboard and an internet connection, became a participant in the conflict. The Israeli government also attempted to capitalise on the online conversations.Realising the importance these mediums play in the propaganda war, they held an unprecedented press conference on Twitter. The Israeli army also set up a YouTube channel and uploaded videos of some of their air raids on Gaza. While no official online presence has been established by Hamas, pro-Palestinian supporters have been using videos and images to effectively deliver their message. The Israeli army showed simple black-and-white videos (without audio) of Hamas-launched rockets, while Palestinians offer vivid videos and images of the chaos and destruction on the ground in Gaza following Israeli air raids. However, the images from Gaza allowed pro-Palestinian supporters to dominate this online war. The battle to gain public favour is becoming increasingly difficult as governments try to meet the challenges of dealing with a more engaged audience. On Facebook, hundreds of thousands of people have signed on pro-Israeli and pro-Palestinian groups. The group Let’s Collect 500000 Signatures to Support the Palestinians in Gaza has 630,002 members while the I Support the Israel Defence Forces In Preventing Terror Attacks From Gaza group has 85,308 members. On Twitter, the tag “#Gaza” has been in the top 10 trending topics since the Gaza war began on December 27. As the propaganda war enters a new phase, governments now need to fully embrace these new technologies and use them to their benefit. Until then, online social communities will continue the debates which will likely last well beyond the current war in Gaza.